You would be hard-pressed to find a union printing resource with a history that can compare to Park Press Printers. Our company was founded in Saugus, Massachusetts in 1934, and if you do the math, that gives us over eight decades of experience. We are also very proud of the fact that we are headquartered in a historic building that was christened 1836. If you like working with companies that have deep local roots and some heart and soul, you are definitely in the right place. Newspaper printing is one of our areas of specialization. We print standard newspapers, tabloid newspapers, and broadsheet newspapers. Our union printing experts can also produce books, so we have you covered if you are a publisher or a self-publishing author. If you ever need a union printing resource that has a lot of experience with political printing, our doors will be wide open. Many candidates target voters that are union friendly, and we can place our union bug on the materials that we create for political candidates. 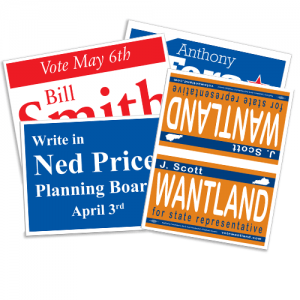 Our offerings include yard signs, letterhead, magnets, bumper stickers, buttons, car wraps, sticky notes, and anything else a political campaign could want or need. Branding is very important in the business world, and we cater to clients that are looking for corporate identity solutions. Our in-house design team can be engaged to help with the artwork, and our union printers can produce presentation folders, brochures, business cards, letterhead, building wraps, and vinyl wraps for commercial motor vehicles. We are the go-to resource for restaurant printing because we have a great deal of experience within this niche. If you ever need a union printer to deliver menus, coasters, buttons, plastic cards, table tents, window decals, or signs, we will be ready, willing, and able to provide assistance. Contact Park Press Union Printers Today! The printed materials that we produce are at the core of our business. However, we wouldn’t have any business at all if we did not take very good care of our customers every step of the way. When you reach out to us, you will receive friendly, communicative service provided by an authentic union printing professional. If you are ready to make the Park Press connection, give us a call at 781-233-0315 or send us a message through our contact page.